#30daysoftesting - Day 2: Start Reading an Automation Book #30daysoftesting - Day 2: Start Reading an Automation Book | That’s a Bug! This text was written as an answer to the “30 Days of Automation in Testing” Challenge. Check it out in the Ministry of Testing forum. Checkout other posts of the #30daysoftesting in this blog here. The second day of #30DaysOfAutomation is one of the simplest: Start reading a book related to automation, in order to comment about it by Day 30. 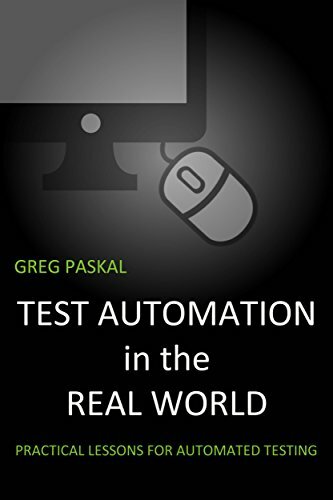 Although I had in my to-read stack some classic and books that I am more anxious to read (and re-read), as Mosley’s “Just Enough Software Test Automation” and Graham’s “Experiences of Test Automation”, I will play safe and pick a shorter and easier to read: The 100 pages long “Test Automation in the Real World: Practical Lessons for Automated Testing”, by Greg Paskal will be my choice. Amazon reviews are a fight of oppositions: Only 4-5 stars comments or 1-start comments - nothing in the middle. For its extent, I do not expect to have an detailed description of practices, cases, and ideas, but maybe one thing or two can trigger some interesting reflections.